A list of Wisconsin Congress are listed below by congressional district. Wisconsin was first inhabited by varied Indian tribes in the 17th century. They included the Algonquian-speaking Menominee, Kickapoo, Miami, the Siouan-speaking Winnebago, Dakota (or Sioux) and Iowa. 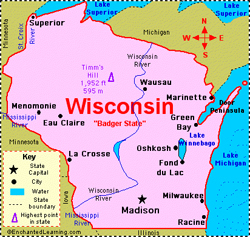 In the mid-1600's other groups entered Wisconsin, including the Fox, Sac, Potawatomi and Ojibewa (Chippewa). 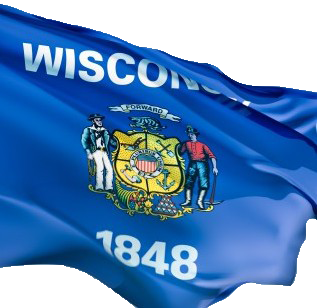 The Wisconsin state flag was adopted in 1863. The State Seal was adopted in 1851. The State Motto is "Forward". The State Animal is the Badger which was adopted in 1957. The State Beverage is Milk which was adopted in 1987. The State Bird is the Robin which was adopted in 1949. The State Dance is the Polka which was adopted in 1993.